Students study the Neolithic Era, when agriculture, animal domestication, and permanent settlements began. They learn about advances in tool technology and about the spread of specific crops and livestock throughout the world. They connect changes in climate and population to the Neolithic advances. Finally, they make the acquaintance of a late Neolithic man whose well-preserved remains, clothes, and equipment have taught archaeologists much about the era. In this experience, students study the Neolithic Era, when agriculture, animal domestication, and permanent settlements began. They learn about advances in tool technology and about the spread of specific crops and livestock throughout the world. They connect changes in climate and population to the Neolithic advances. Finally, they make the acquaintance of a late Neolithic man whose well-preserved remains, clothes, and equipment have taught archaeologists much about the era. In scene 2, students compare tools of the Neolithic era with tools of the Paleolithic era. 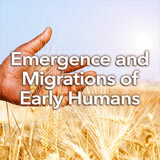 To make the most of this comparison, this experience is best used in conjunction with the experience Emergence and Migrations of Early Humans. Explain how geography affected the development of agriculture in the ancient world. Describe how agriculture and metallurgy affected the emergence of civilization. Describe technological and social advances that gave rise to stable communities. Compare the lifestyles of early hunter-gatherers with those of agricultural communities. The invention of farming and animal domestication was the biggest revolution of the past 10,000 years. It changed where people lived, the kinds of dwellings they lived in, the kinds of jobs they performed, the foods they ate, and their governments and social classes. It enabled many times more people to live on Earth. It even changed the physical environment. 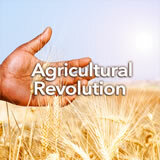 In this experience, you will learn the What, Where, When, Why, and How of the Agricultural Revolution. And you’ll find connections among those huge changes. Archaeologists have dug up part of a Neolithic dwelling on a remote island off Scotland. Look at the picture above and notice the details you can. Then click through an image gallery for illustrations of Neolithic farm life. Based on the images, what can you guess about how Neolithic people lived? Discuss student responses. As a class, come up with several questions about the life of Neolithic people.